Each of us has our own truth, which is valid for us. Stand firm in your truth, but also allow others to have their voice. This first card flows naturally into the next one, meaning that if you think outside the square you will unlock your unique potential - be a leader, not a follower. If you are at a point where you need to choose a direction, trust that the one you choose will be the right one for you. It is time to move forward. I hope the cats' guidance works for you today. International Cat Day is 24 hours of recognition and veneration of one of humanity’s oldest and most beloved pets, which takes place on August 8. The festivities were put together for the first time in 2002 by IFAW, the International Fund for Animal Welfare, among other animal rights groups, to celebrate the most popular pet on the planet. An estimated 500 million cats are thought to be frolicking in neighbours’ gardens across the world, which means that most every extended family is bound to have an aunt with more kittens than former husbands, whatever the country or climate. And that’s great, because owning a cat has been shown to improve mental health and to relieve stress, anxiety and depression. So when it’s raining cats and dogs outside and you don’t have someone to cuddle with, any black, ginger, Persian, Siamese, Burmese, Bengal, Shorthair, Munchkin, Balinese, RagaMuffin or any old stray cat will do the trick. It would also be a good time to consider donating time, money or maybe your old blankets to a cat charity. 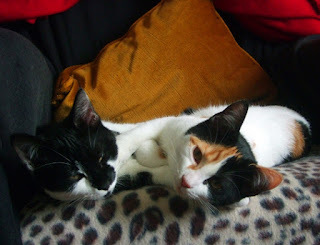 I am personally very grateful to Cats Protection, which kindly gave me a voucher to pay for my kittens Tommy and Tuppence (pictured right) to be neutered. They had the operation last week and seem to be recovering purrfectly.